The global waterjet cutting machinery market is primarily driven by the overall increase in activities in the manufacturing sector of several key regions. The market also benefits from the growing need for manufacturing process automation and waterjet cutting requires a lesser need for manual intervention and human guidance, even in terms of secondary finishing. Global waterjet cutting machinery is also found to be in high preference due to their ability to carry out processes while eliminating the formation of heat, smoke, and dust. However, high maintenance costs and the overall problems regarding worker safety are currently restricting the global waterjet cutting machinery market. The global waterjet cutting machinery market is expected to reach US$1.66 bn by the end of 2016. The market’s revenue is estimated to expand at a CAGR of 8.1% during the forecast period from 2016 to 2024, and is likely to reach US$3.11 bn by the end of 2024. In terms of applications, the global waterjet cutting machinery market is segmented into job & machine shop, machine manufacturing, exotic metal and non-traditional material cutting, glass/metal artwork, ceramic/stone cutting, fiberglass cutting, gasket cutting, foam product cutting, surgical instrument manufacturing, electronics, slitting operations, and a small percentage of minor applications. Amid this large scope of applications for waterjet cutting, the market finds its leading percentage of demand to come from the segment of jobs and machine shops. This segment has always held a conventionally high demand for cutting tools and machinery and waterjet cutting is no exception, especially due to the several advantages that this method provides over other methods. Currently, the global waterjet cutting machinery market is being propelled by the growing demand for these tools from the automotive and fabrication industries. There is a very high demand for process automation in several industry verticals and especially in the automotive industry. This provides a great niche for the global waterjet cutting machinery market to fit into owing to the high rate of customization that its products can offer. From a geographical perspective, the global waterjet cutting machinery market has been segmented into the key regions of North America, Asia Pacific, Europe, Latin America, and the Middle East and Africa. 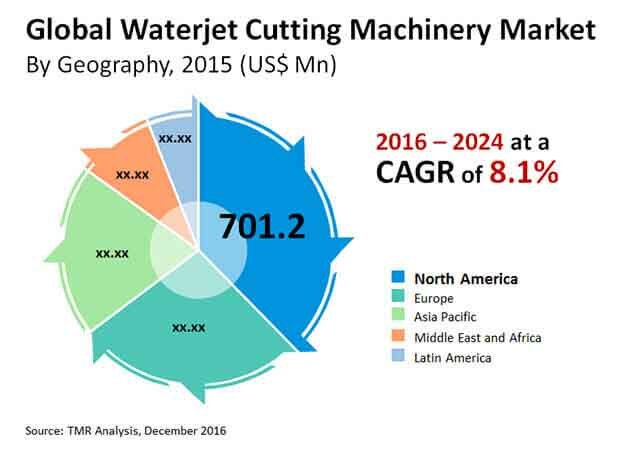 Among these, the global waterjet cutting machinery market was led by North America in 2015, owing to a high demand from several core end users. It is also highly likely that North America will remain the leading region in terms of demand as well as revenue generation in the global waterjet cutting machinery market for the foreseeable future. The manufacturing industry within North America – especially in the U.S. – is providing the global waterjet cutting machinery market with ample growth opportunities and it is possible for this demand to increase even further as the manufacturing industry expands. Players based in North America are also known to provide a high level of customer support and customer satisfaction, thereby gaining a greater line of clientele. At the same time, Asia Pacific is expected to rush forward with a phenomenal rate of demand growth over the coming years, owing to a speedy rate of evolution of its industrial sector and ramped up manufacturing processes. To date, the global waterjet cutting machinery market has been dominated in several aspects and periods by names such as DARDI International Corporation, ESAB Group, MD Corporation, KMT Waterjet Systems, Inc., A Innovative International Ltd, Manufacturers Supplies Company, Flow International Corporation, Water Jet Sweden AB, Bystronic Laser India (Pvt.) Ltd., WARDjet, Inc., Waterjet Corporation s.r.l., BFT GmbH, TECHNI Waterjet, Jet Edge, Inc., Hypertherm, Inc., Uhde High Pressure Technologies GmbH, OH Precision Corporation, PressureJet Systems Pvt. Ltd., Water Jet Germany s.r.o., OMAX Corporation, WSI Waterjet Systems International, Resato International BV, Hughes Pumps Ltd, and NLB Corp.